In all seriousness though, and by James’ own admission, breaking the five-minute beer mile barrier wasn’t a walk in the park. Much like any other endeavor — be it software product development or sending someone to the moon — it required planning, prioritization and hard work. It also required data. That’s where we come in. We wanted to see if Wizeline’s product intelligence solutions could map a training plan for James that would lead to a better outcome. Could we turn tacit knowledge into a ranked list of training priorities? A few weeks after James broke the record, we enlisted a few of his runner friends to help chart his path to success. Using Wizeline’s Prioritization Surveys, we gathered expert data on which training investments were most likely to yield results. As feedback came in, Wizeline’s algorithms programmatically ranked the competing priorities. Was it more important for James to shed upper body weight? 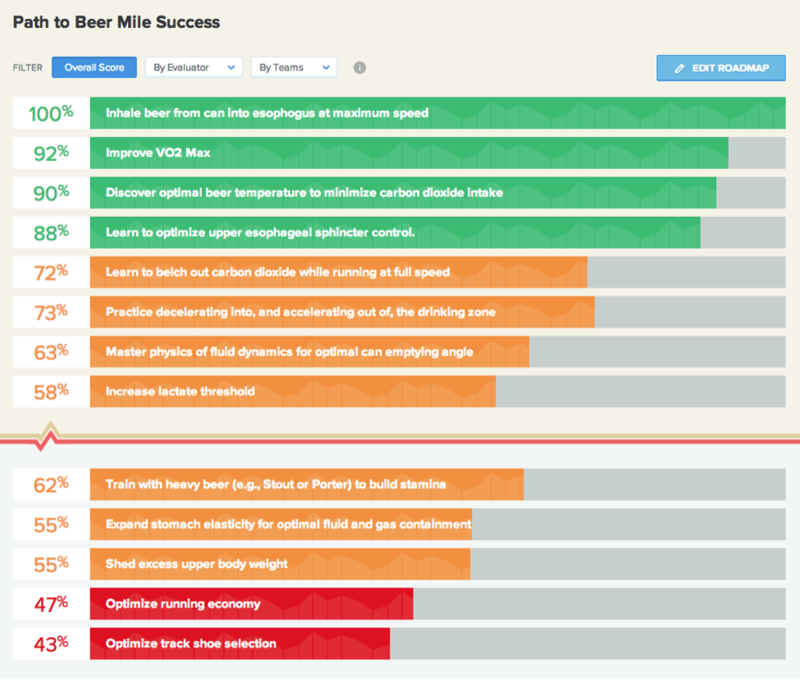 Or should he instead focus on optimizing his beer consumption? It’s worth nothing that, yes, these type of results were a first for us at Wizeline — since our platform is designed first and foremost for Product and Sales teams looking to increase the success of their B2B SaaS solution, website or application. But the fact remains that — even for this somewhat silly example — Wizeline was still able to zero in on most of James’ top priorities. The platform also helped collect, prioritize, and quantify important insights in a fraction of the time (which would have allowed James to make better planning decisions faster and start training sooner). Case in point: While we can’t divulge all of The Beast’s secrets, he swears that at least three of the items that rank above the wizeline were 100% critical to his success. Can you guess which ones? Posted by on Friday, June 20, 2014.